I usually keeps reviews for my professional blog, which is just a blog to showcase my writing but I love writing film and book reviews so I'm going to start putting some of them on here. So here is the first one. After growing a bit tired of the repetitive plots of modern day horror films and the heavy reliance on blood and gore to provide a thrill I was hoping The Woman in Black would be something different. 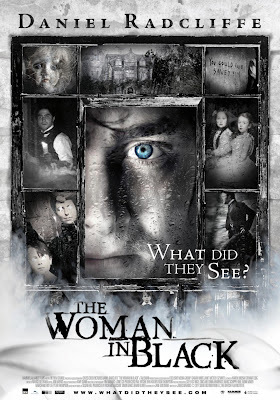 Made my Hammer Film Productions, The Woman in Black sees a return of the more traditional way of making a horror movie. Famed for the Hammer Horror period in the 1950′s Hammer Films have proven that you don’t have to rely on gore to make a good movie. Based on the book of the same title by Susan Hill, The Woman in Black tells of a young widowed father Arthur Kipps (Daniel Radcliffe) who sets off to a small village to handle the estate of the recently deceased Alice Drablow. Eel Marsh House, the estate in question, is situated on a lonely island in the marshes. Despite warnings from villagers to not go to the house, Arthur bows to the pressure of his job and goes to collect all the paper work. On his first day there he hears footstep in the house and see’s a woman stuck in the grounds of the house. Arthur soon discovers that Alice had a sister, Jennet and her son was taken from her by Alice and her husband and they raised him as their own before he died in the marshes. Soon after Jennet killed herself not been able to deal with the grief of losing her son. 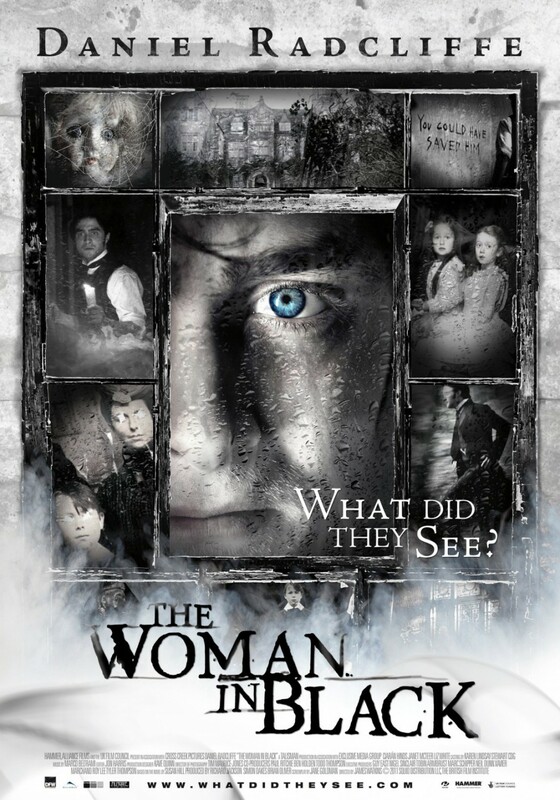 The villagers believe that whoever sees ‘the woman in black’ which is in fact Jennet’s ghost, brings about a bad omen which makes children kill themselves. After several of the children in the village die, Arthur too believes that Jennet’s ghost is responsible for the deaths as some sort of revenge for her own son been killed. Arthur heads back to the marshland of Eel Marsh House with his friend Sam Daily and they try to recover the body of Nathaniel, Jennet’s son so they can reunite them. After succeeding in doing this they bury his body alongside Jennet’s. Believing they have put the ghost to rest Arthur and Sam head to the train station to meet Arthur’s son, Joseph. As the Sam and Arthur say their goodbye’s Joseph lets go of his fathers hand and heads towards the train tracks just as Sam looks up and sees the woman in black standing on the platform. This is the best horror film I have seen in a very long time. The traditional scary movie conventions are brough back to life to create a film that is full of jumps and genuine moments of terror. The dark, brooding atmosphere of the film adds to the tension that really gets your heart beating and the jumpy moments are well placed and not completely predictable which leaves you on the edge of your seat. Casting Daniel Radcliffe as Arthur Kipps creates a real talking point for this film, this been his only major role since the Harry Potter franchise it’s hard not to look and think ‘Oh it’s Harry Potter’. The fact he is playing a widow and a father also adds to the diffuculty of getting past ‘the boy wizard’ image. But this is no fault of Radcliffe’s, in fact after the intitial shock of seeing ‘Harry Potter’ in another film I soon got over it and found his role quite convincing, it seems it is just going to take a while to shake off the image of one of the most famous wizards. I highly recommend this film if you’re looking for a genuinely scary movie and have grown tired and modern day, gore filled, slasher films. I love your polka dot blog!